Snake Takes 2012 PKC National Championship! Read more: Snake Takes 2012 PKC National Championship! 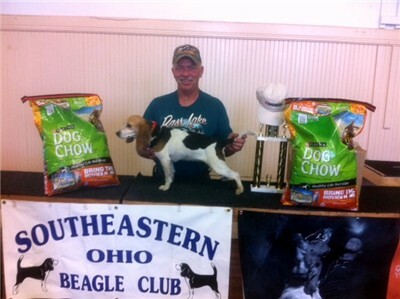 West Lafayette, OH – The McVay Memorial Bench Show saw 35 beagles and handlers competing for the titles of Champion of their respective divisions in the bench show. The Best of Show and Best Female of the show was Harley owned and handled by Greg Moore. Below are the rest of the day’s bench winners. 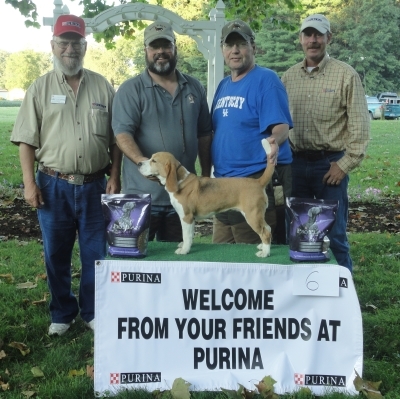 Shown with Owner Greg Moore, Paul Moore, and Purina Representatives Mike Luchetta, and Karl Gunzer.